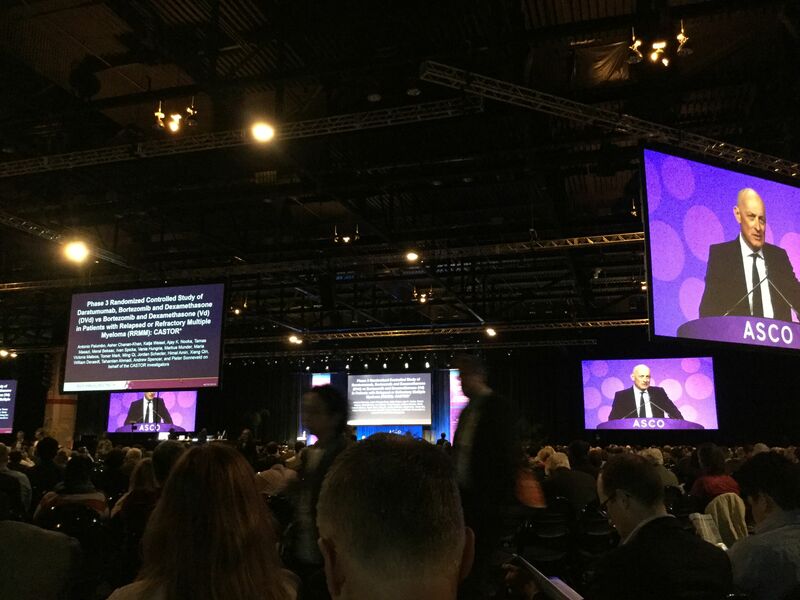 The American Society of Clinical Oncology (#ASCO16) annual meeting featured several significant oral scientific presentations on the blood cancers over the weekend here in Chicago. CPX-351: A session on hematological malignancies Saturday afternoon included a discussion of final data from the Phase 3 clinical trial of Celator’s drug CPX-351 (Vyxeos ®). LLS invested substantially in this study through our Therapy Acceleration Program (TAP). The study was in a small subset of elderly patients diagnosed with secondary acute myeloid leukemia (AML) – either it had developed from myelodysplastic syndrome or as a result of treatment from another myeloid cancer. 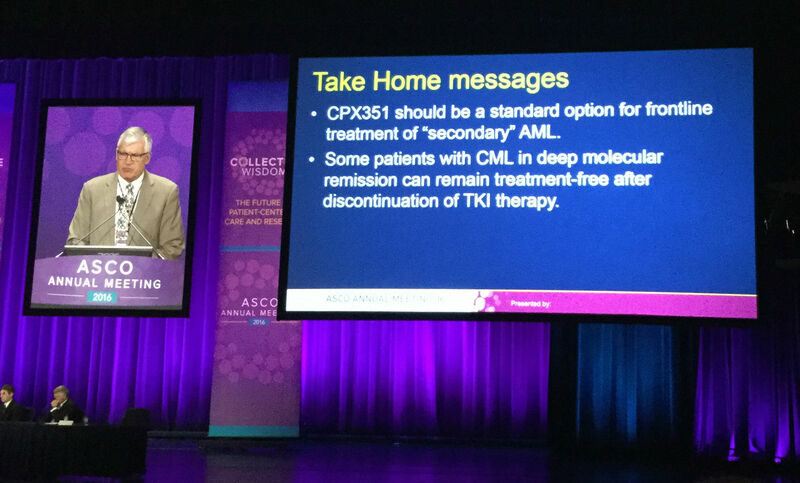 Dr. Jeffrey Lancet of Moffitt Cancer Center presented the data, showing that CPX-351, an innovative reformulation of standard chemotherapy, outperformed the standard combination of cytarabine and daunorubicin (generally known as 7+3) by all measures: the primary endpoint – overall survival; and other secondary endpoints, such as event-free survival, complete response, overall response, safety and even for those patients who subsequently underwent a stem cell transplant. Both Dr. Lancet, and Dr. Richard Larsen of University of Chicago, who moderated the question and answer portion, asserted that the drug should become the first line therapy for this patient group. Celator and Jazz Pharmaceuticals recently announced a merger, with the hopes that Jazz can help bring the drug, which recently received breakthrough therapy designation by the FDA, the rest of the way through the regulatory review process. Stopping TKI’s: Another presentation focused on a study in which patients with chronic myeloid leukemia (CML) who take a life-saving daily pill called nilotinib (Tasigna ®) – a targeted therapy from the same family as imatinib (Gleevec ®) – stopped taking their treatment. There are currently several such studies in which patients stopped taking their pills under closely monitored circumstances to determine if it is possible for them to remain in remission.. Dr. Larsen said that in general, about 50 percent of patients in these studies remain in remission. The others return to therapy and are able to get their disease back under control quickly. Gleevec was the first of these so-called tyrosine kinase inhibitors (TKI) to achieve FDA approval about 15 years ago, thanks in large part to LLS’s early support, and LLS has supported the advance of several of the other TKIs as well. More on CAR-T: Two studies on Chimeric Antigen Receptor T-cell immunotherapy (CAR-T), genetically engineering T-cells to home in on cancer, both supported by LLS funding, were presented as well. The CAR-T approach has now been taken up by three pharmaceutical companies trying to bring the therapy to market - Novartis, Kite and Juno. Dr. Larsen pointed out that all three have seen relapsed/refractory acute lymphoblastic leukemia (ALL) patients achieve between 80-90 percent complete response. In one study, presented by Dr. Noelle Frey of the LLS-supported University of Pennsylvania team, the goal was to determine what the optimal CAR-T dosage and scheduling is for relapsed/refractory adults with ALL. The results show that for some of the patients, delivering a higher dose but splitting it into two parts rather than delivering all at once is more effective and less toxic. Dr. Jae Park of Memorial Sloan Kettering Cancer Center, who is also funded by LLS, talked about their CAR-T study looking at impact of disease burden on response to therapy. They found patients with minimal disease at the time they received the engineered T-cell infusion had less toxicity and more durable responses than those with more cancer cells remaining in their marrow at the time of treatment. Park said his findings supported using CAR-T earlier, possibly even as front-line for some relapsed/refractory ALL patients. CAR-T is now being tested in other blood cancers, including lymphoma and myeloma, and even in some solid tumors, such as ovarian cancer, but the tests are still very preliminary. Other investigational AML therapies: Three other investigative treatments for patients with AML were also presented during this session. One was a peptide vaccine for patients with AML that targets the WT1 protein. Of the 22 patients in the study, 10 died, but of the 12 remaining, 9 remained in complete remission and the average prolonged survival for these patients was 65 months, an encouraging result for patients with a very difficult to treat blood cancer. Venetoclax, a therapy recently approved with LLS support to treat patients with chronic lymphocytic leukemia, is now being tested for AML. Early phase study shows tolerability and promise but more study is needed. Another study for a drug targeting the FLT3 mutation in AML was also discussed. Again, early signs showed good tolerability of the drug but more study is needed to show efficacy. and bortezomid (Velcade ®). The results were “unprecedented,” said Dr. Antonio Palumbo of University of Torino (Italy), who presented the findings. Palumbo said that adding daratumumab into the mix resulted in 70 percent reduction in the risk of cancer progressions and doubled both the partial response from 29 percent to 59 percent; and the complete response from 9 percent to 19 percent. Daratumumab is the first monoclonal antibody approved for myeloma and it targets the CD38 protein on the surface of cancer cells. Precision Medicine: One of the featured studies presented during the media briefing on Saturday did not directly pertain to the blood cancers but was certainly of interest. The “MyPathway” study, also known as a basket trial, tested four different approved cancer therapies based on the patients’ genetic mutation rather than the origin of their tumor in the body. This concept of precision medicine – targeting the mutation rather than the specific body part – is an area of growing interest. The mutations were HER2, BRAF, EGFR, and Hedgehog pathway and the patients in the trial were admitted if their type of cancer fell outside of the FD- indicated use for the drug being tested. Several patients in the trial achieved positive results, supporting further study of this precision medicine concept. Patients with blood malignancies were not included in this trial, however several of the mutations, including, BRAF and Hedgehog pathways, are both also implicated in several types of blood cancer. Most patients with hairy cell leukemia have the BRAF mutation and have experienced good results from the one of the drugs in the trial, vemurafenib (Zelboraf ®). This Reuters article discussed this trial.